Grijalbo-Dargaud and Hodder-Dargaud published some titles in English and Catalan in the same book (bilingual, each page printed twice). List kindly provided by Alfons Moliné. Note: two titles differ from the Grijalbo-edition(*). Translator Victor Mora. Around 1977 a set of eight books was published by Mas-Ivars (Barcelona). There are actually two separate Catalan editions, Catalan as spoken in Barcelona and Valencian. All these "old" albums where translated by Monserrat Albó Corrans. Note that there are two editions. 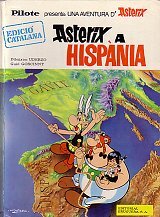 A first print having Una aventura de Asterix and a second print with Una aventura d'Astèrix as top line on the cover. Moreover, on the inner cover page Asterix says Estan Bojos eixos romans! and Estan Grillats eixos romans!, respectively. Only [6,7,9,10] exist in the first edition (investigated by Walter Habraken). Old Catalan: "Un poblet de Gals irreductibles resisteix com sempre l'invasor." New Catalan: "Un llogaret del Nord habitat per gals indomables rebutja una i altra vegada ferotgement l'invassor." Valencian: "Un poblet de Gals invençuts resisteix com sempre l'invasor." This title has been reported to have two editions, one Catalan, one Castilian. No map text with this edition. The space under the map is left completely white. El combat de caps / El combat dels caps and Astèrix a Bretanya / Astèrix a la Bretanya.